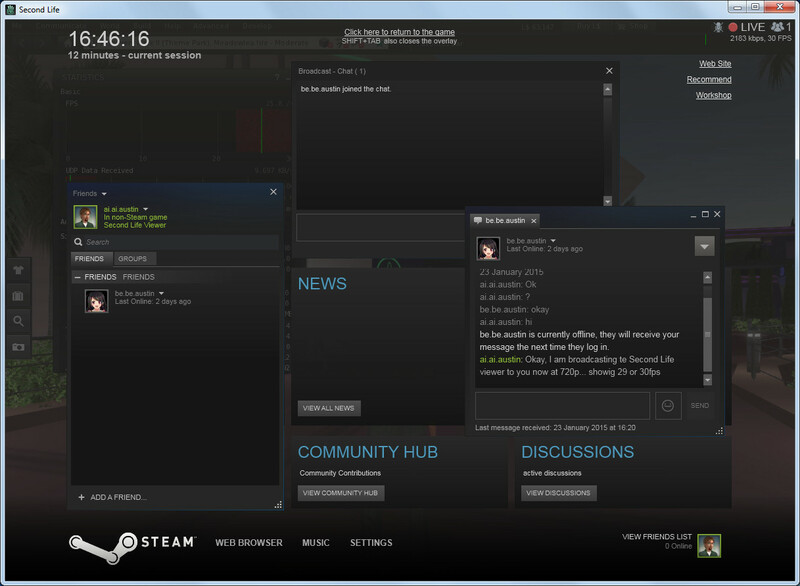 Steam has a broadcast feature that lets others watch you play a Steam game or run a Steam launched application. 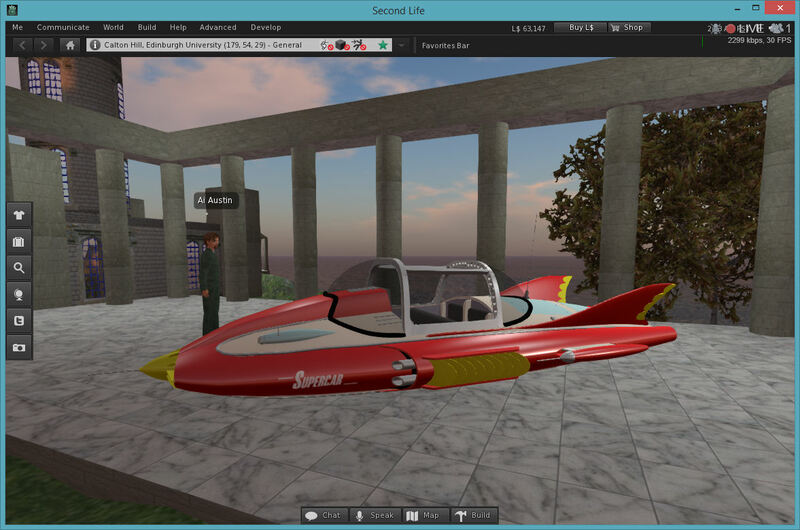 This can be used to broadcast Second Life activity. 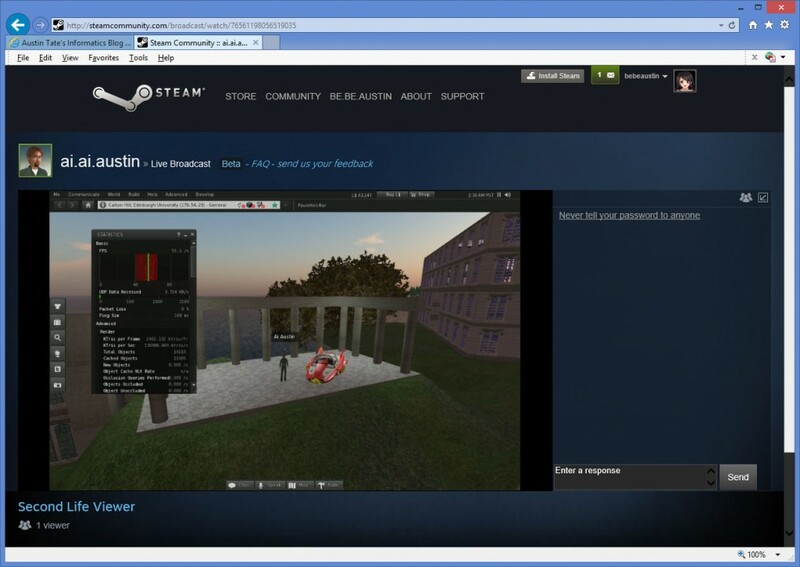 You add your choice of Second Life viewer to your Steam games then others can watch. 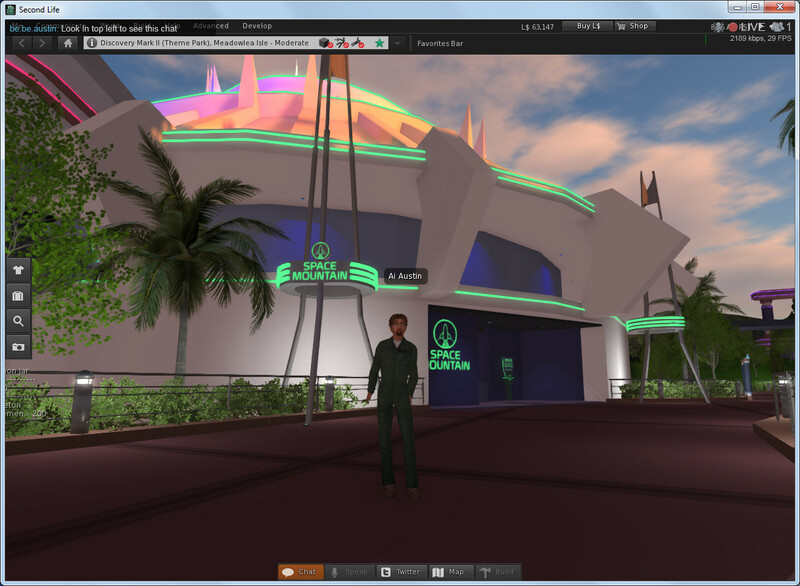 This works with all Second Life and OpenSim clients. 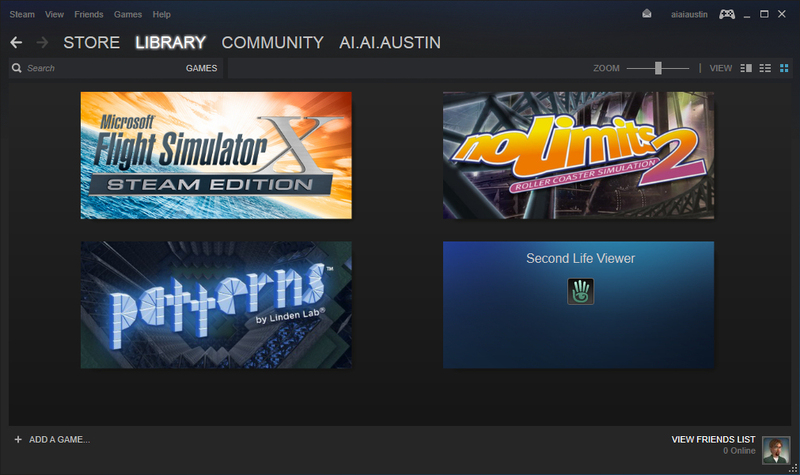 The chosen viewer can be added under your Library of Games by selecting “Add Non-Steam Game”. 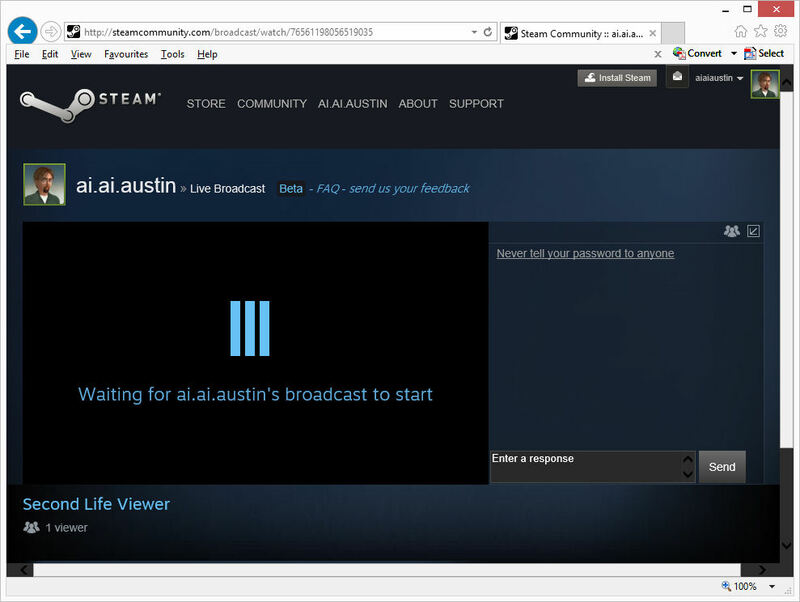 The person viewing the broadcast does not need to have the Steam client installed, it can work it a browser. Requests can be made from a friend while logged into steam in a browser via http://steampowered.com. 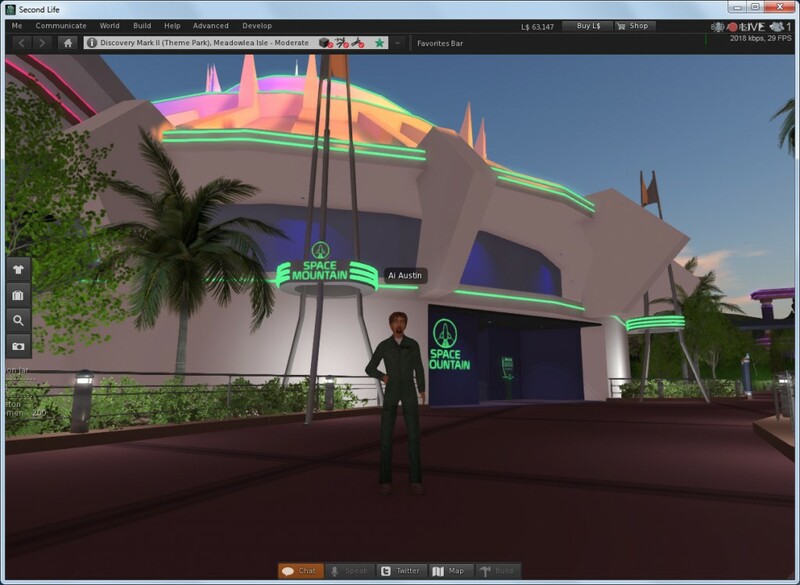 Tests were conducted on a 50mbps home broadband cable connection with Second Life running at approx. 25fps according to the in viewer statistics. 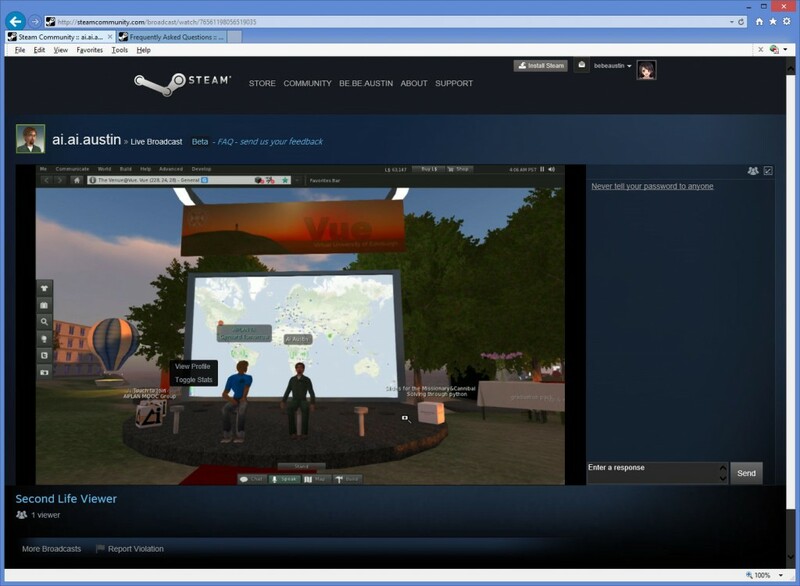 Steam Broadcast was set to allow friends to request to watch, 1280×720 (720p) format, and allowing for 2500kbps max broadcast bandwidth, the Second Life Viewer showed that it was broadcasting using approx. 2000kpbs and achieving a steady frame rate of 29/30fps. 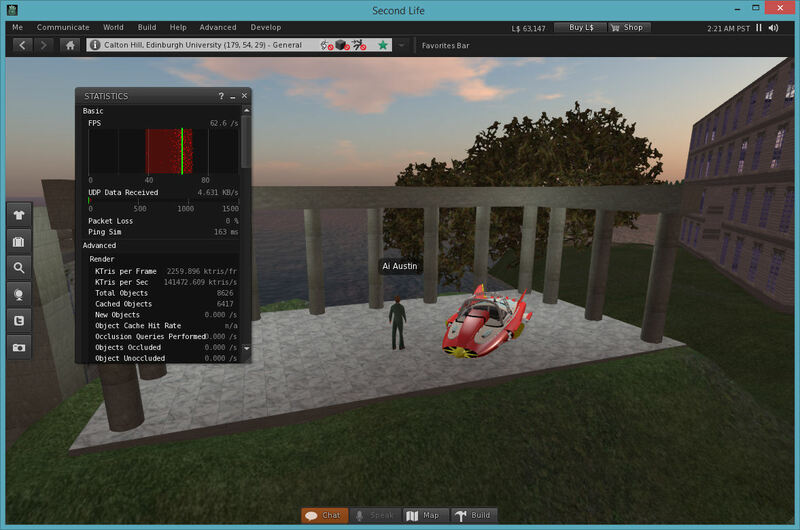 The watcher was on a Microsoft Surface under Windows 8.1 using Internet Explorer 11 and saw the 720p broadcast very smoothly, subjectively as smooth as it appeared in the main Second Life viewer. There was approximately a 7 or 8 second delay from action on the Second Life Viewer and it being seen by the watcher, which is better than we previously achieved using an Apple Mac Media Server Quicktime Steaming Service (QTSS) Broadcaster where delays of 10 to 15 seconds between broadcast and receiver are typical. 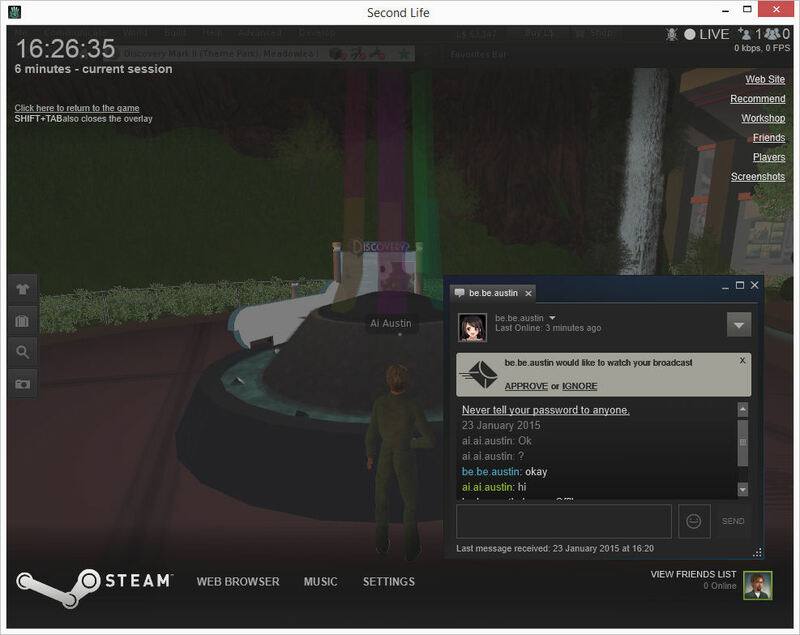 The Steam overlay can be brought up or dismissed while in the Second Life Viewer using shift+tab as shown in this image..
Second Life running alone without being launched via Steam was achieving approx. 62fps. 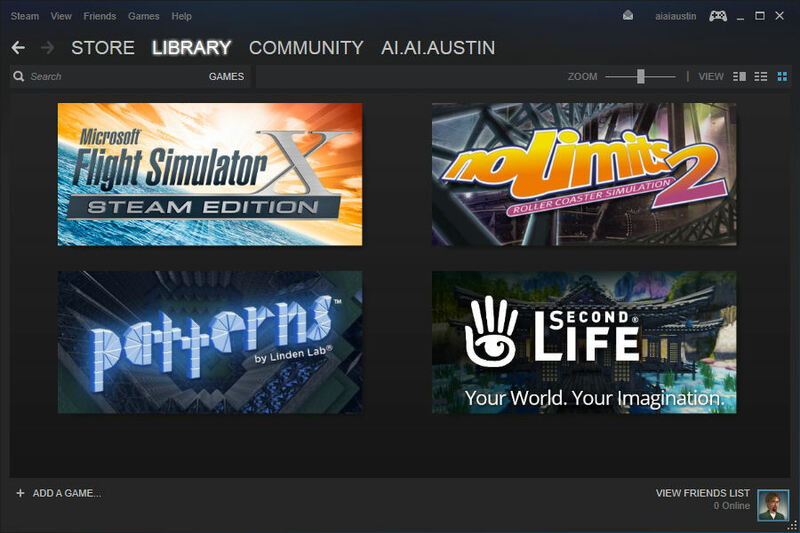 Second Life launched via Steam was achieving approx. 59fps. 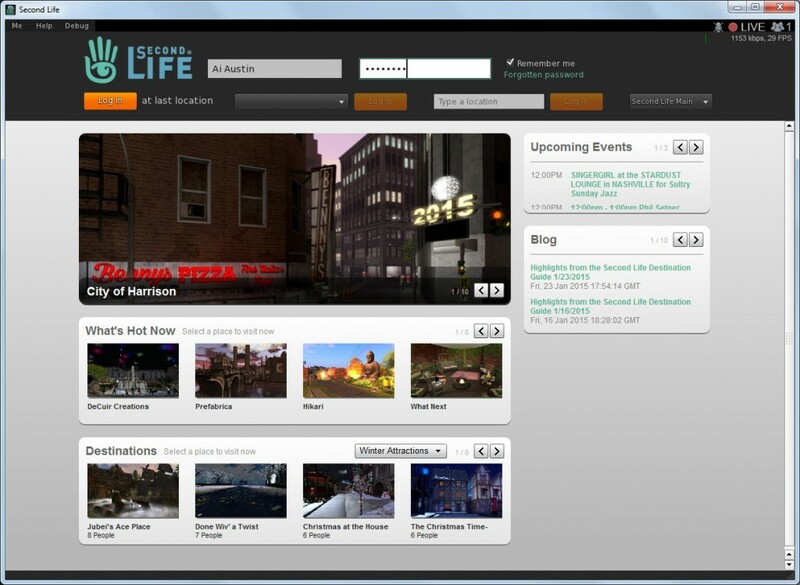 Second Life launched via Steam with a watcher was achieving approx. 55fps. 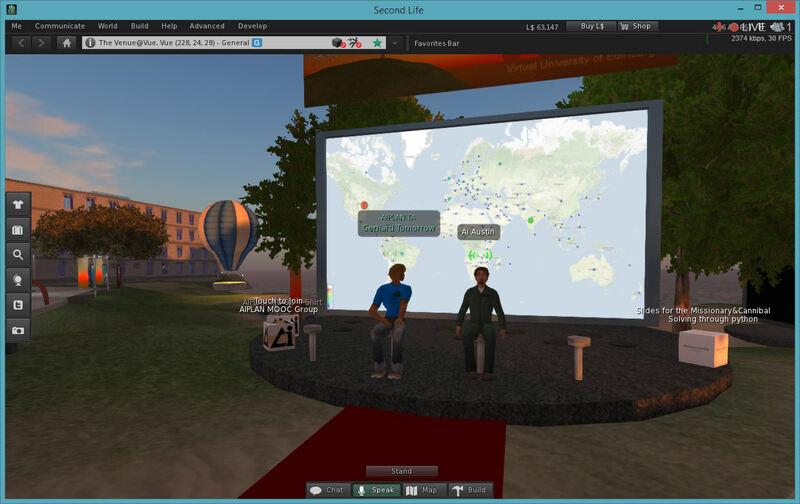 The Second Life Viewer showed that it was broadcasting using approx. 2300kpbs and achieving a steady frame rate of 29/30fps. The watcher was on a desktop PC under Windows 8.1 using Internet Explorer 11 and seeing 1280×720 (720p) video that looked smooth after a delay of approx. 8 seconds. User interface sounds (such as mouse clicks), environmental sounds in world (such as wind, water and other ambient sounds, media playback such as via media screens, videos, etc. all worked fine. 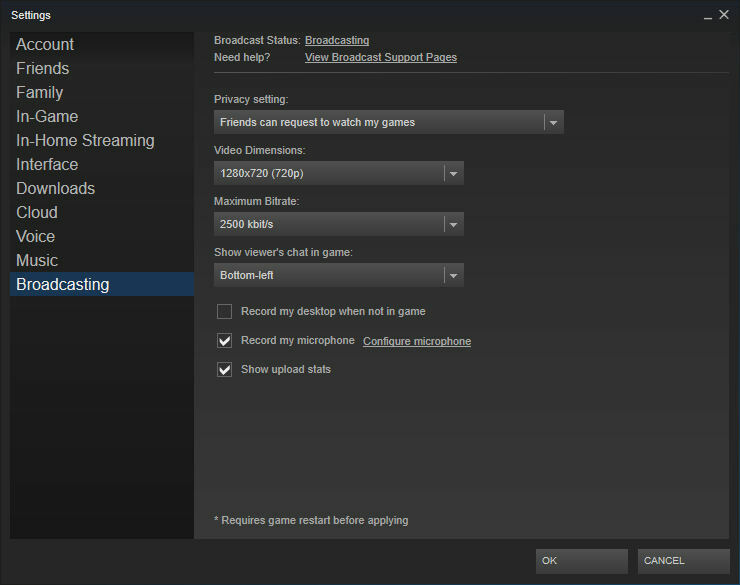 To hear the broadcaster’s in world (Vivox) voice, the Steam settings for broadcast need to have the “Record my microphone ticked and the appropriate microphone selected, otherwise this is suppressed. In world (Vivox) voice from avatars OTHER than the broadcaster is heard in the watcher view. 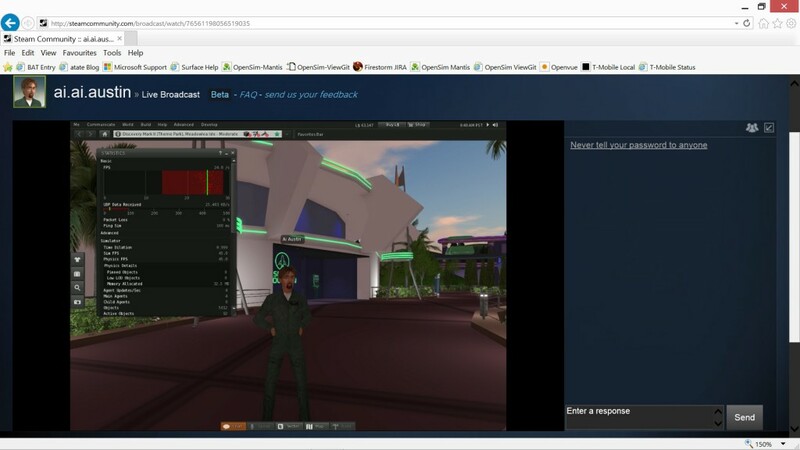 The green bars over the avatar head indicating sound is being broadcast can be seen, but no voice is heard. 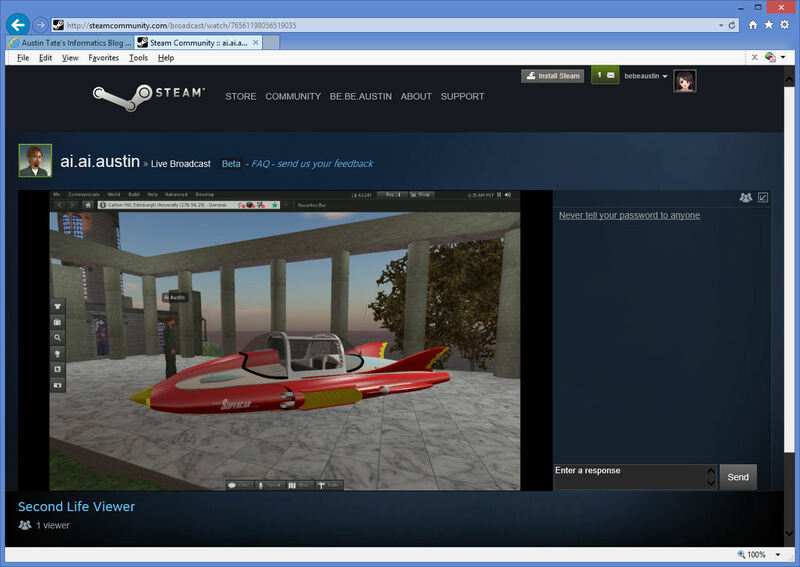 A custom image can be set to display for the Steam Control Panel view, using a 460×215 sized JPEF, PNG or TGA image… a couple of samples are given here based on the Second Life home page. 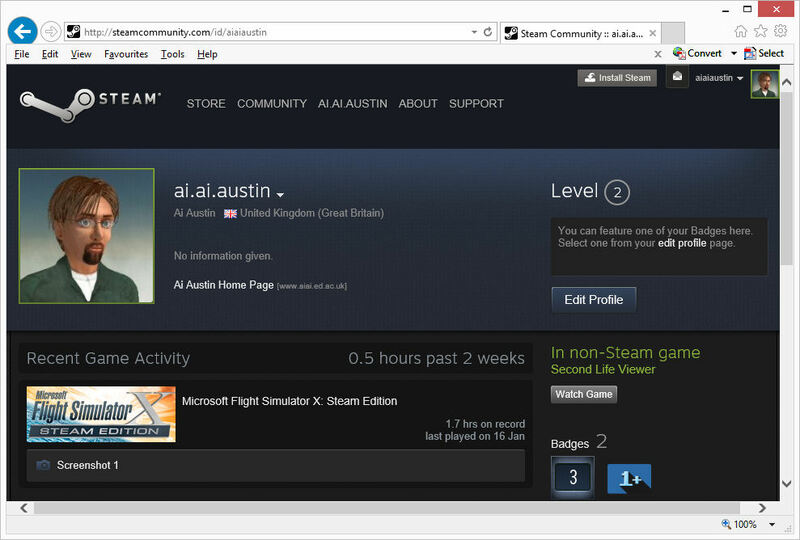 Set the Custom Image via a right mouse click on the entry for the added viewer in the Library > Games screen. The chat window to talk between broadcaster and watchers needs to be able to be “broken out” of the window frame of the game itself.. and available without bringing up the full Steam overlay, so it can be placed alongside the game play to keep an eye on what is being said and to be able to respond. At present the single line showing briefly that incoming chat is available is not enough to maintain this contact with watchers. The LIVE button and red dot along with the frame rate being achieved (if you select that to show) is useful, But if that could be an active control to turn on, off and pause the broadcast it would be more helpful than having to use the Steam overlap or be unsure if you are broadcasting. I found a bit of confusion over the “game” chat and the friends chat… and found the watcher was chatting in the friends chat tool rather than the one the broadcaster was looking at as game chat. There was confusion over the online/offline status of the watcher when they were using a normal browser to watch the broadcast, but was logged in via that. It would be more helpful if logged in users on the web showed as online rather than offline. The broadcaster can watch their own broadcast via a windows.. this is also limited to be within the frame or window of the game.. it would be more useful if it could be broken out and also shown without the full steam overlay being brought up, which disrupts game plan to do so. This entry was posted in Media, Second Life, Virtual World and tagged Broadcast, Second Life, Steam. Bookmark the permalink. While not intended for broadcast style streaming, there are also discussions on using a streaming methods to provide access to Second Life and OpenSim via viewers being streams to lower capability devices,. like tablets, via a streaming method. “SL Go” was such a service but was terminated in March 2015. Alternatives are being tested. 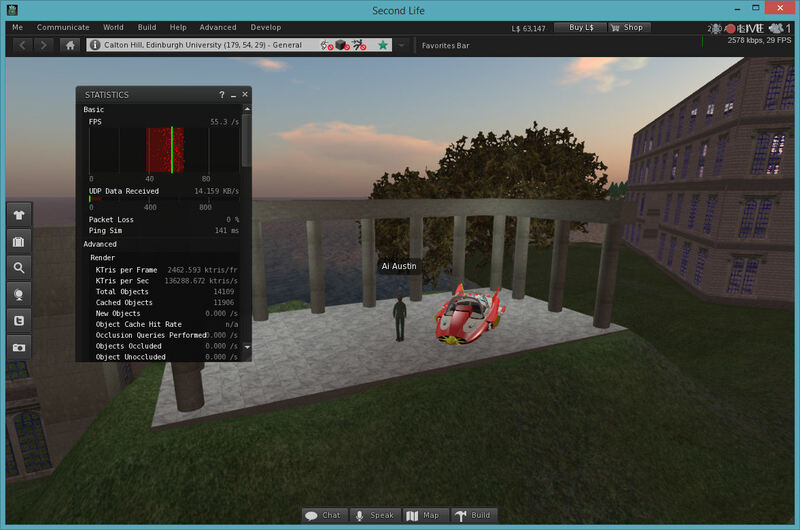 On 14th April 2015 Inara Pey blogged about streaming Second Life (and other grids)using “Frame”.